Hello, I have a Lexmark X544 printer and have bought replacement cartridges from you for it in the past. Prints are now exhibiting clear yellow striped burning on the paper and I'm advised that this is the fuser. Please can you kindly confirm if this is correct (or otherwise) before I commit to buying a complete 40X7563 fuser unit. Are there any user-serviceable parts that could solve this issue, without that kind of outlay? Thanks and regards, Andrew Ashby. It really does depend on which part is causing the error as to which item you'll need to buy. We advise you to contact Lexmark's technical support team who should be able to run through some troubleshooting steps with you in order to diagnose the fault. We can recommend that you perform 2-3 head / nozzle cleans while leaving 20 minutes between each clean in the hope that this may resolve any print quality issues. Otherwise, it's likely that you'll need to replace your Lexmark 40X7563 fuser which is the part in your Lexmark X544 printer which is responsible for fixing images to the page. Hi, I'm trying to find an imaging kit for a Lexmark X543 PS printer. Could you possibly send me a link to use so I can order one as I'm unsure of which one I need ? Thank you. If your laser printer is low on laser toner you'll be able to make fantastic cost savings by just obtaining all your replacement Lexmark X544 toner cartridges supplier. Considering Cartridge Save's competitive prices and also our low price policy you can be certain of finding the best deal on Lexmark X544 toners. It is our intention to please every single shopper by giving great rates on all high quality Lexmark X544 toners cartridges which function reliably each and every time that you use them. We give you speedy and free delivery on all Lexmark toner. This particular lower priced Lexmark X544 toner can be ordered online at our checkout page so don't delay and purchase today for the chance to save money. However, you'll be able to order this great value Lexmark X544 toner by ringing through on our order number. Remember, Lexmark X544 toners sold by us will also be covered with a cast iron money back guarantee which enables you time to claim a refund so customer support is by no means very far away. To get the ultimate deal on Lexmark X544 toners you simply can't get anything better than purchasing with Cartridge Save. 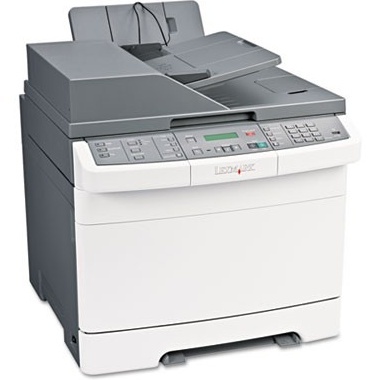 The Lexmark X544 is a multifunction machine, with a laser printer, digital copier, scanner, and fax capabilities. This printer does heavy duty work for its relatively small size, and is perfect for a home office or small business owners. The laser printer does both black and color printing, and Lexmark X544 toner is among the more cost effective of other printers in this class. The scanner and printer handles a variety of media sizes, and can print on many types of media including transparencies, labels, and pre-cut cards. With a recommended monthly volume of 800 - 3,000 pages, this printer is designed to handle heavy use of a busy home office or even a small business. It comes standard with a large memory of 128 MB and can be upgraded to 640 MB. Its fax and scan-to-email features help to streamline workflow. The Lexmark X544 has a max copy speed of 25 pages per minute, and a similar print speed of 23 pages per minute for both black and color printing. Its high speed USB connectivity is designed to work with Window, Apple, and Linux operating systems, and the X544 is Ethernet ready. Lexmark X544 toner is separated into black, cyan, magenta, and yellow to allow for maximum toner use efficiency. The Lexmark X544 has a compact size of 43 cm x 54 cm x 46 cm, with a digital two-line display built-in. The scanner/copier can enlarge media up to 400% and reduce to 25%. Using the X544's Ethernet connectivity, scan-to-email and fax without the need for the computer. A generous 1,200 x 1,200 dpi resolution and its ability to print on multiple paper sizes makes the X544 workable for moderate quality laser photo printing. For large documents, the X544 offers automatic duplexing. Laser printing is not ideal for high quality photo printing, and no binding, collating, or stapling features are built-in for document finishing. Though the printer uses 4 separate Lexmark X544 toner cartridges, the printer will not function if one of them is empty. A very limited service warranty is offered for this machine.